Formed in 2012 and hailing from Austria, Witchrider clearly love bands such as Queens of the Stone Age, Soundgarden, Kyuss, and Black Sabbath, and what they offer us is that fuzzy, heavy rock that makes you want to bang your head like there’s no tomorrow. The first song OCD is reminiscent of the desert/stoner rock that Queens Of The Stone Age are famous for, thanks in large part to the main guitar riff. However, we quickly realize that this record is a journey through many chapters of rock history (The Fog, for instance, has a slow, doom metal riff). On the other hand, there’s also the feeling these guys are just playing the kind of music they love and grew up listening to, and the influences we are discussing here are a simple consequence of their past as avid rockers. Their passion, in fact, is undeniable – the album is an intense listening experience and you can even hear them laughing at the end of 1 For 5, making it clear they had a great time in the studio. This album is definitely a great way to boost your mood if you are feeling down and also an awesome choice if you want to throw a party and drink lots of beer, or even if you’re preparing to embark on a long road trip and need something to make your adventure more exciting and enjoyable. Witchrider’s music is also so powerful that they can probably adapt to any environment – a jam-packed stadium, a small and dirty club, a summer festival, you name it – they will certainly knock it out of the park. 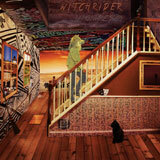 One must also mention how diverse Unmountable Stairs really is: sure, there are wild moments, but I’m outta Breath, for example, has an Alice In Chains vibe and a much more melodic atmosphere; the album even features acoustic guitars, and some psychedelic elements here and there. But perhaps the biggest compliment we can give the band’s most recent studio effort is that it never- and I mean never gets boring. In the end, the message is simple: go get this album and have fun!! Rock is not dead! In fact, it is alive and well!